It's always fun to attend baby shower parties of friends or a relative but sometimes we run out of ideas on what to give as a gift. 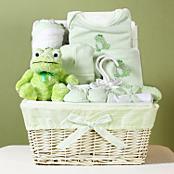 It is always best to scour the net and look for ideas on gifts for a baby shower party. There are actually lots to choose from these days, since cute personalized items are now readily available. I personally love to give gifts that the baby can really use so that it will not be a waste.